The top of the editor shows a list of motors. You can select one of the motors from the list by selecting it with your mouse pointer. The selected motor is shown with the blue line. 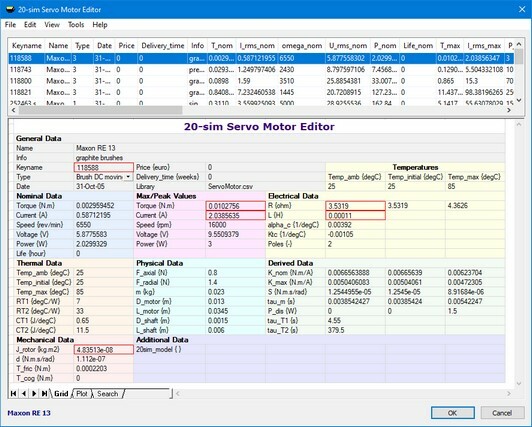 The parameters of the selected motor are shown below the list. To see the torque speed plot of the selected motor, click the Plot tab at the bottom of the editor. To find a motor based on specific searching conditions, click the Search tab. 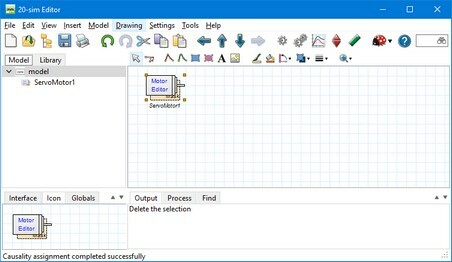 By clicking the OK button, a dynamic model will be created automatically, based on the selected motor in the list. Using the Edit menu, new motors can be added to the list or deleted. By double clicking the mouse pointer on a parameter value, it can be changed.